9. a_record_or_collection.df() – Displays all the fields of either a record or a database collections, this is useful for debugging purposes. Please NOTE the difference if you are using ‘a_record_or_collection.describe_fields()’ – it gives you all fields with values. 9. a_record_or_collection.df() – Displays all the fields of either a record or a database collections, this is useful for debugging purposes. This is just a quick post on the very useful tool that I’ve been using for many years. Today I had to do some stuff on a new environment and I realised that I am so used to this tool. So I though that you might find it useful too. 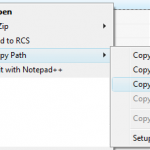 This is a shell extension to copy the path of a file or directory to the Clipboard. Just an extra option added to the right click menu. With some extended configuration options. To install – just unzip the file and right-click on PATHC400.INF file and choose “Install” in the context menu.